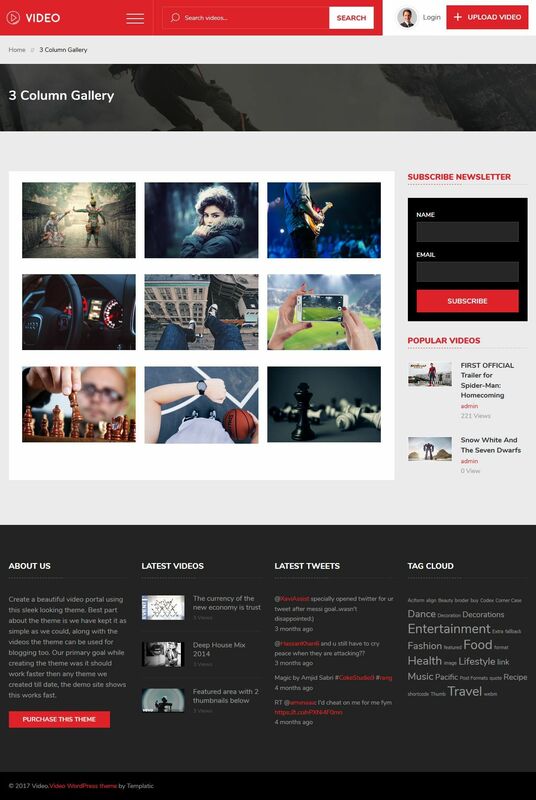 Vivo is a powerful WordPress theme to create multipurpose Video WordPress websites. The theme is best for creating Video portals, YouTube-like video websites, video/image galleries, etc. There’s no limitation on what you can create with it. 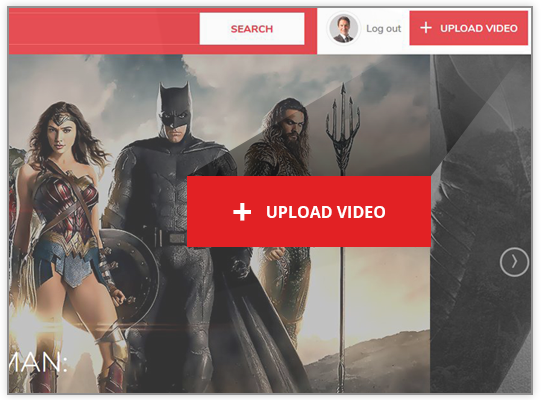 Utterly flexible, engaging and logical design, and abundant features make this theme the best Video WordPress theme ever. 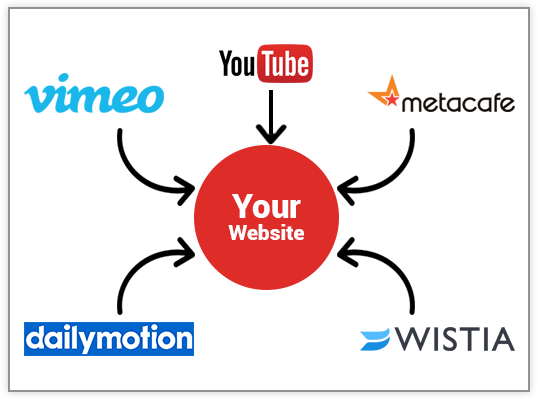 Create websites like youtube, Vimeo, Dailymotion, Twitch, Veoh, Liveleak, etc in minutes. 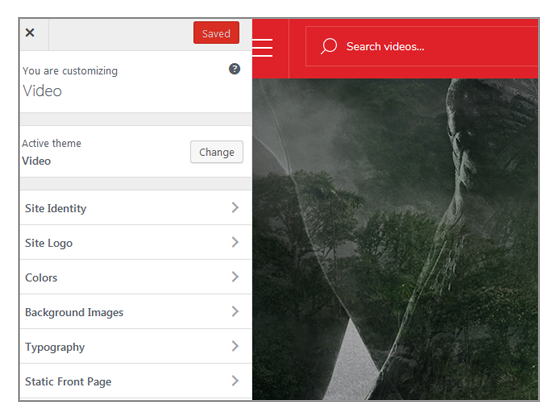 Upload your own videos or embed from the popular video websites. 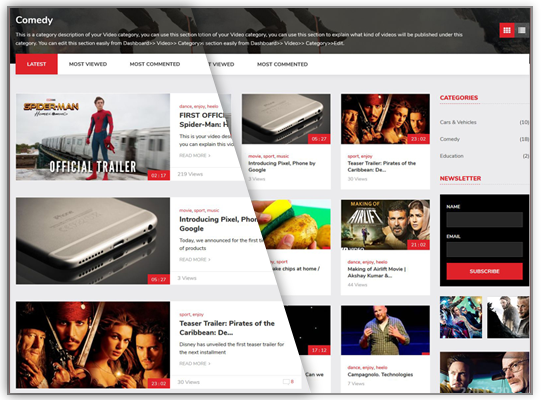 It comes with a flexible slider, integration with YouTube for view counts, support for self-hosted videos, several detail page designs, several homepage layouts and much more makes Vivo the perfect choice. What is the Vivo Theme? Create a video website that looks gorgeous on any device it is viewed on. No more boring menus!! We have enriched this theme with this creative mobile navigation menu, where the menu drops down with all the menu items, this gives a sparky experience to your users. 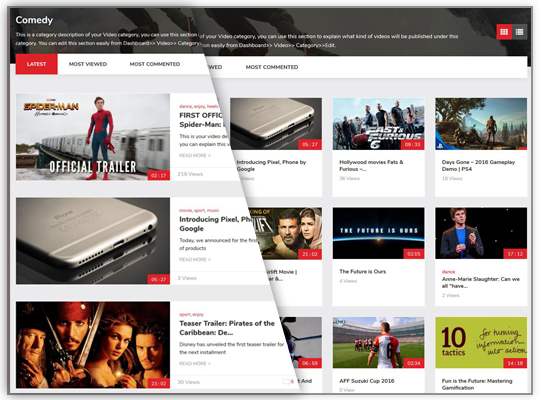 Want a video on your any of the popular Video website to be displayed on your site? Easily embed the videos by copying the video script or the url. 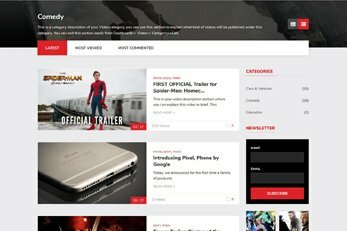 You can display the best videos from around the internet on your website with the easiest way possible. Click here to know more>> If you want to upload a video from your local machine, you can do that too!! You have a choice here – Choose Automatic thumbnail or upload an image to set as the thumbnail image. When you choose “Automatic thumbnail”, all you need to do is upload the video. The thumbnail image will be set automatically. What a great idea to accessorize your Video theme homepage banner with a video slider. You can easily show your featured videos on homepage using the inbuilt video slider. Alternately, you can also configure the slider to display HD image banners to convey the central idea of your website. 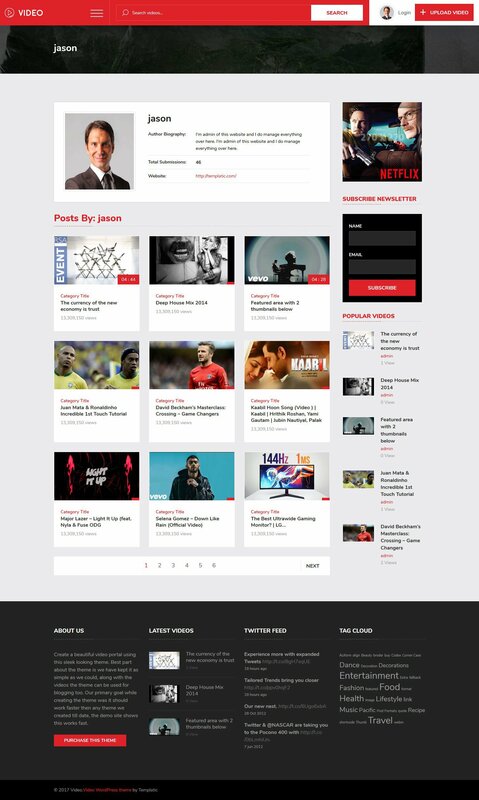 The video WordPress theme is elegantly responsive. The responsive view makes it easy for the users to steer through your website conveniently. 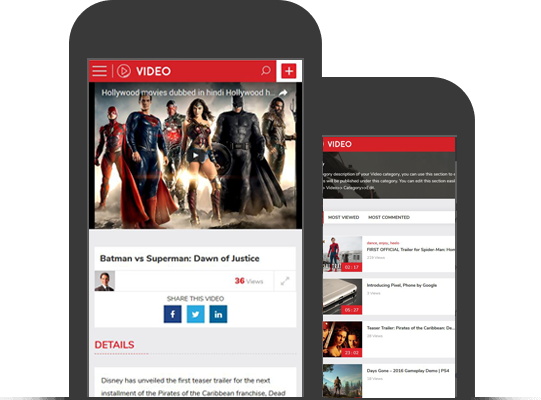 The video website is designed to look as good as an mobile application in your handy devices. Click here to have a look at the mobile demo of this theme. Let you visitors register on your website and submit their videos through the video submission form. 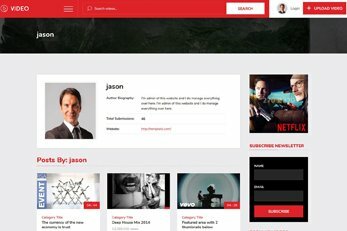 The Upload video button is available right at the homepage header, where the users can notice it instantly. 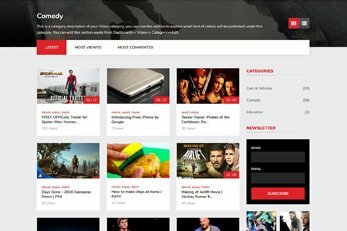 This feature helps you create YouTube like websites quickly and easily. Read more about Front End Submissions. You choose the way in which the videos are listed on a video category page. 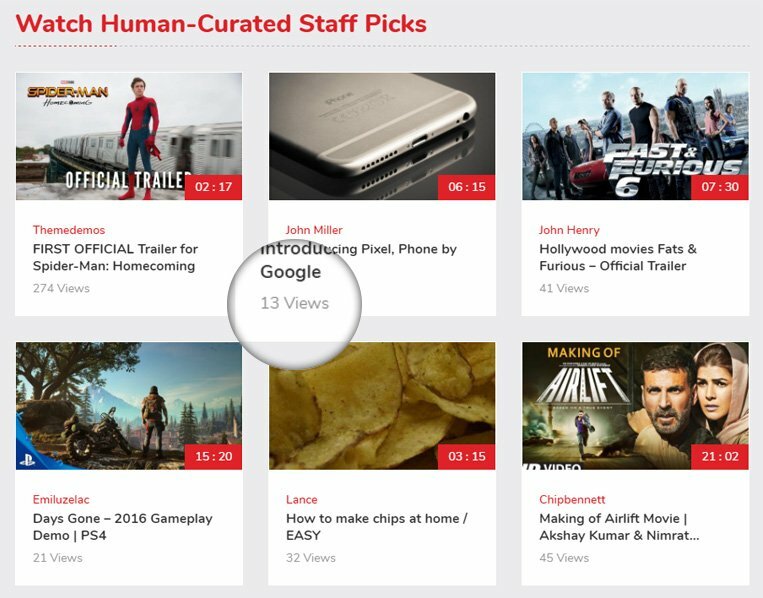 You can opt for the list view or the grid view to display the videos on video page. Moreover, show other useful links, categories, tags, subscription form, image gallery, etc. in the sidebar for maximum exposure. You can also list videos without sidebar, where the videos will be listed over the full width of the screen. 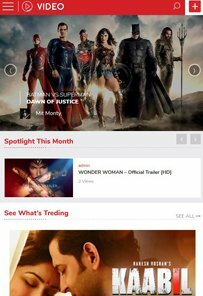 You can choose this kind of display if you do not have much to show in the sidebar and you want to display more videos on the screen at once. 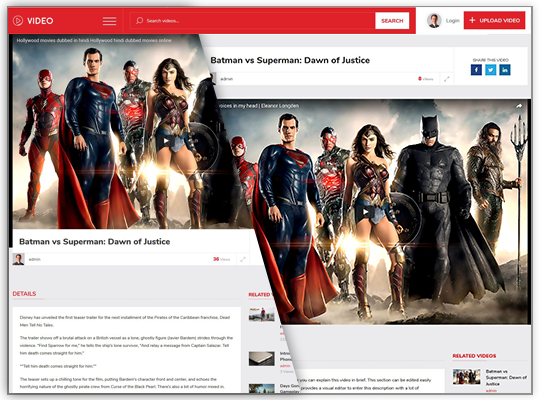 Different pages of the video theme can have different layouts. 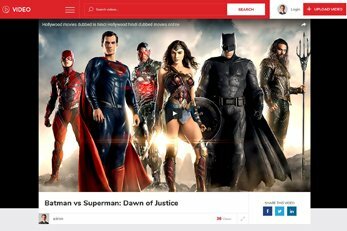 The video detail page too has a unique layout. For your website, you can choose the type of page design you want. 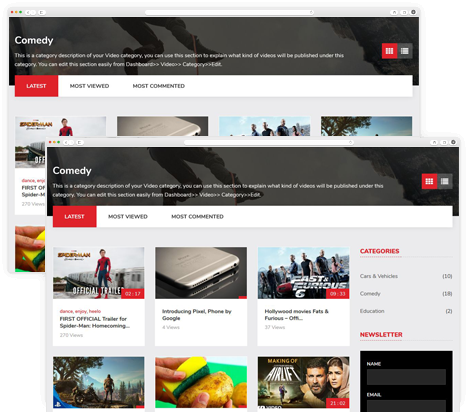 For the videos on your website, the theme comes with numerous features. The theme is designed to retain the video resolution to provide the best user experience. Create a website that is easy to search using the search features and the hierarchical categorization. Here are some of the best features for the videos hosted on your website. Showing view count on the video page is certainly an advantage. If you aren’t embedding, or want to display your own view count, you can display views manually for plays on your site. 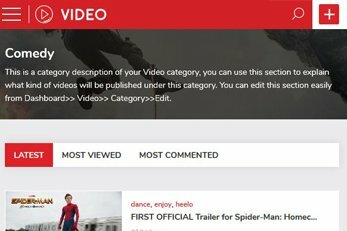 When the users select a video category, the category page for the selected subject will open. 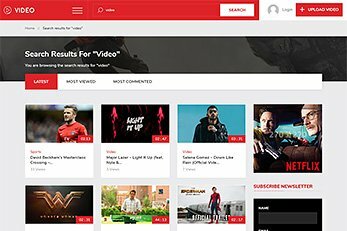 The category page will list all the videos falling under the chosen category. You can choose the category page style too. 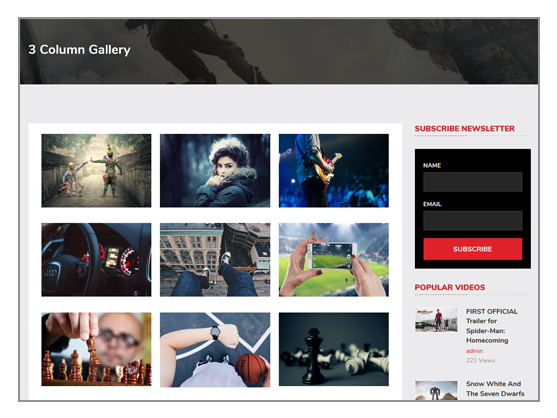 Display HD images on your video website using the incorporated gallery options. The pages are pre-designed, all you need to do is to add your images and proper title to your gallery pages. The gallery pages come with elegant parallax banner area. Create beautiful photo albums in minutes. When we say that Vivo is flexible, we mean flexible – in every way. The options of the theme provides you the opportunity to change the appearance and the behavior of the theme as per your requirements. Furthermore, we’ve tested Vivo theme with popular WordPress plugins that you can use to extend the functionality of your website. 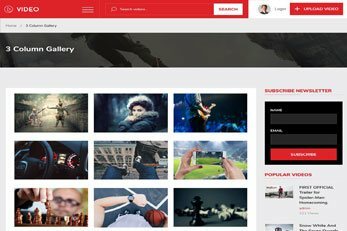 For example – Create spectacular galleries using Envira gallery, or sell your products using the WooCommerce plugin. Click here to check the compatibility list. This Video theme has been tested with world popular WPML plugin. This is the perfect plugin for creating multilingual video websites. You can of course translate the theme into another language with the provided .PO and .MO files. Read more on this. 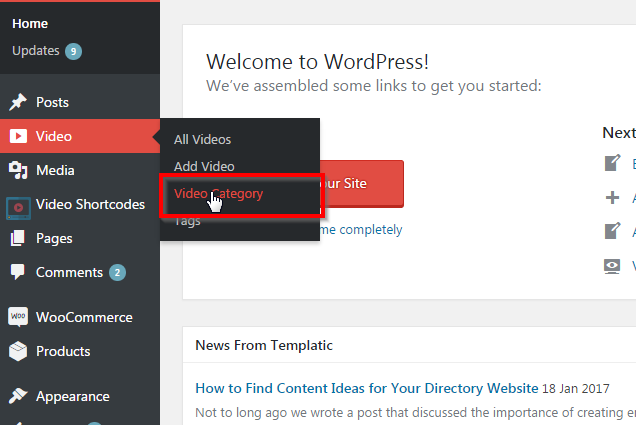 Working with Video WordPress theme is so easy. The back end options to adjust the theme’s appearance and features are all intuitive and well-organized. 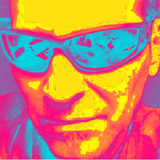 Personalize your website using the customization settings. The theme options will let you adjust the features, activate/deactivate services, and set your web pages. We understand how important it is to be noticed. Therefore, the video theme is completely search engine optimized. It’s code was built with SEO in mind. For the SEO of your pages, posts and content you add, you can use any of the popular free SEO plugins such as Yoast SEO, All In One SEO, Google XML Sitemaps and All In One Schema.org Rich Snippets. How good is this theme for SEO? 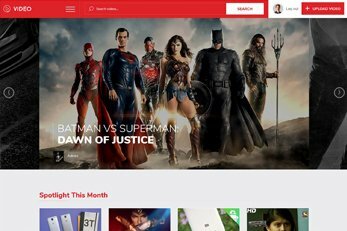 The Video theme is also WooCommerce ready. This free plugin will load yozur website with all the ecommerce features. 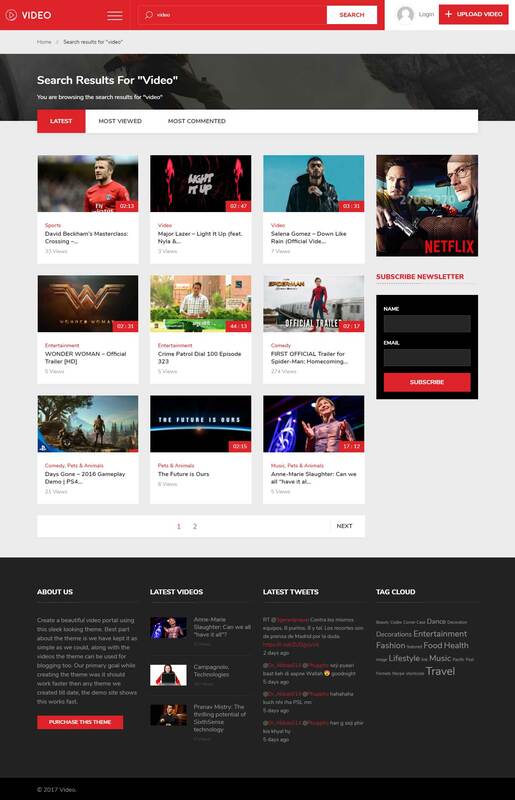 Furthermore, The Video theme comes with pages exclusively designed for WooCommerce. You can create beautiful and full functional online store. The best thing is, you won’t have to write a line of code for this. 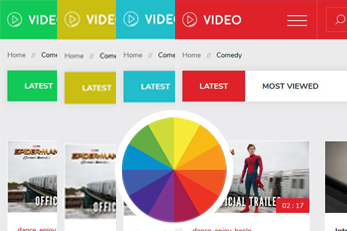 Some of the features which make video theme one of the best out of others. Searching for a video mades easy with search which is provided with the theme. Customize theme colors to match your color scheme straight from your admin panel. This theme utilises awesome Google Fonts to give it unique looks. Video features social media integration that will help you get traffic and increase your views. 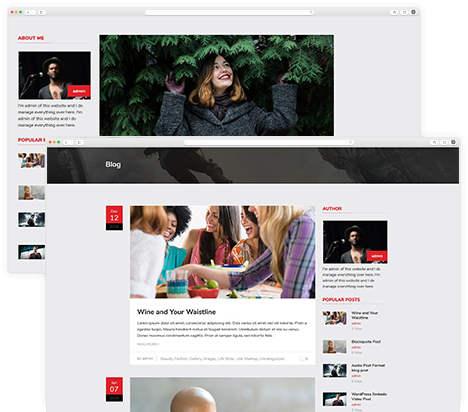 We’ve included different post and Video layouts, so you can choose how to structure your content. We’ve included number of widgets so you can build your site and populate your sidebar easily. Video is ready for search engines and optimized to help you rank higher and get more visitors. The theme is optimized for Adsense, so you’ll see higher earnings in Adsense. Easy to show author information on post and videos which belong to them. 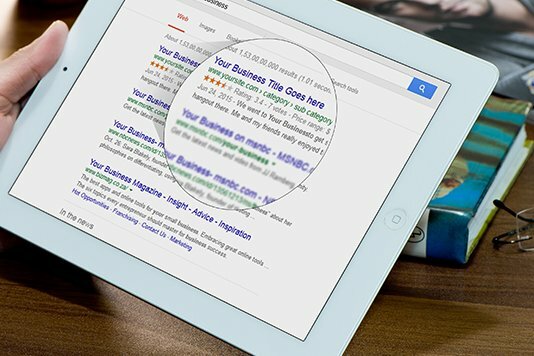 The breadcrumbs feature helps both users and search engines navigate your site, and find their way back to where they were. You can place number of widgets in your sidebar and populate your site as peryour need. Once you purchase Video it can easily be installed by just one click and you’ll be ready to go. 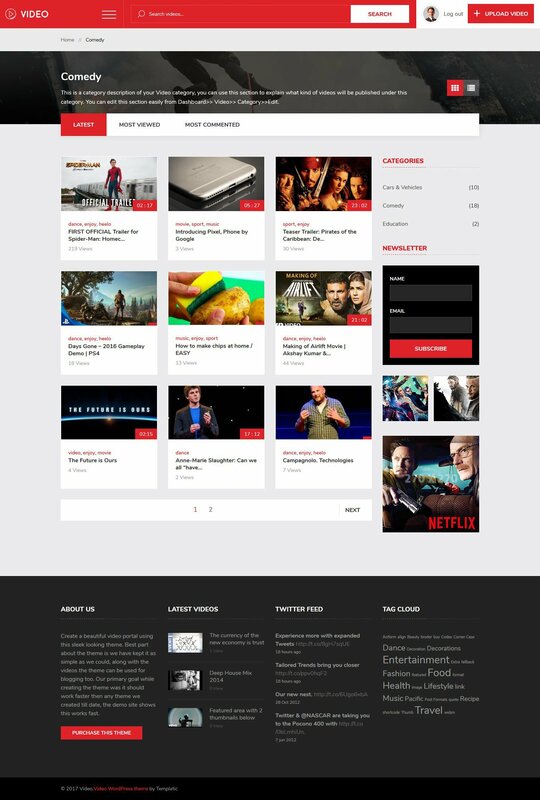 Video theme comes with documentation that will help you understand all the features of the theme. At any time you encounter any issue, don’t worry our friendly and knowledgeable support staff is always around. Easiest theme for Beginners like me to be able to make my own website. They arrange test site to try it out even before purchasing. The support is awesome at Templatic, They made a hard task easy. If your considering getting a WP theme don't hesitate Templatic is the best. Yes, We do provide One Click Easy Install using which your videos website is ready with content allowing you to setup the theme quickly. Yes you can localized the theme in any language. Yes, there is endless customization possibilities. You can make the changes as per your need. 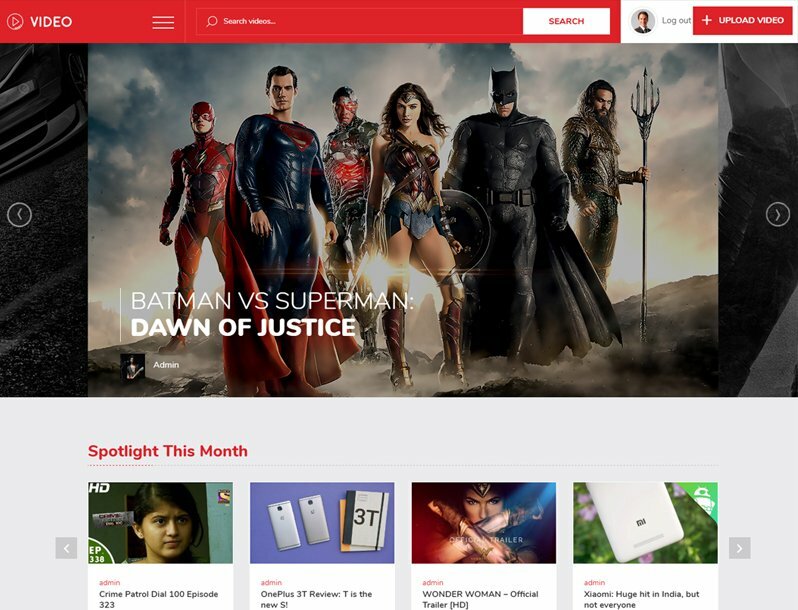 Will the theme runs on latest WordPress version? Yes, the theme is compatible with the latest version of WordPress.